How do I select the correct voltage converter/transformer for my equipment? ( Step down or step up) How many watts/amps do I need for my converter to work with the equipment I have? Should I purchase a voltage converter/transformer that is more powerful than my equipment?If so,how much more power (watts/amps) should my converter be able to handle? Because these questions should be on your mind when planing a trip overseas, 110220 volts has created a tool that will help you answer these questions. Go to our Voltage Converter Help page answer a simple 4 question questionaire about your equipment, and get a list of what are the voltage converter/transformers that will work for your specific needs. The voltage converters/ transformers selected above are suitable to work for 110-120 Volts (USA & CANADA)items. For example TVs, DVds, VCRs, Radios,and lights,with total power usage between 0-1000 watts,that need to be utilized in a foreign country with voltage supply of 220-240 Volts (EUROPE, ASIA, most countries in South America, & Africa) . Different items also suited in this category are Laptops, phone chargers,kitchen appliances, such as blenders, mixers, rice cookers, irons, coffee makers and some personal items such as shavers and curling irons and hair dryers. Make sure be familiar with power consumption of you appliance prior selecting your voltage converter/transformer for you. 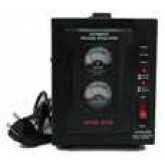 Don't forget to take advantage of our Voltage Converter Help page to find out which voltage converter would be the best suited for your needs. Note: voltage converters should NEVER be used at 100% capacity. Please make sure to calculate a 30% slack for you converter to work with for non-motorized equipment, and 100% slack for motorized equipment. Example: a laptop (non-motorized equipment) that consumes 70 watts to work needs a 100 watt converter/tranformer (30% Slack). While a small shaver (motorized) that consumes 50 watts also needs a 100 watt converter.transformer(100% slack) to be able to operate properly.